The electrical activity of the heart is followed by mechanical activity, which consists of contraction (systole) and relaxation (diastole). The mechanical activity shows pressure, volume changes and associated with this, there are production of heart sounds. The mechanical events are repeated in a cyclical fashion and each cycle lasts for 0.8 sec, for the heart rate of 75/minute. 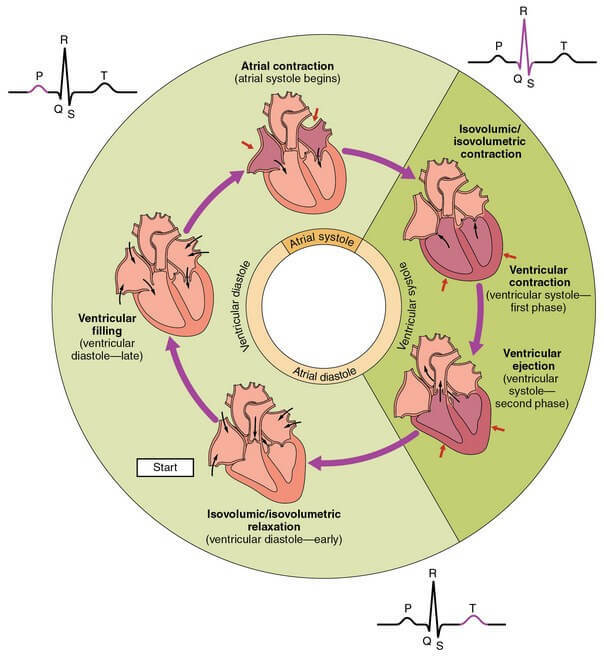 Increase in heart rate (tachycardia) decreases the duration of cycle. Each cycle has ventricular systole and diastole. The systole lasting for 0.3 sec and diastole for 0.5 sec. The atrial systole (0.1 sec) is included in the ventricular diastole, as it occurs at the end of this phase. The atrial diastole (0.7 sec) is not considered, as it overlaps ventricular systole and diastole. Systole begins with the closure of AV valves. The ventricle is a closed chamber and the contraction of ventricle becomes isometric,as the tension rises without change in volume. This isovolumetric contraction lasts for 0.05 sec. The increase in pressure in the ventricle leads to the opening of semilunar valves. That is, in the case of left ventricle, the pressure rises from 20 mmHg to more than 80 mmHg, forcing the aortic valve to open. The right ventricular pressure rises from 0 mmHg to more than 10 mmHg, to open the pulmonary valves. The opening of semilunar valves results in ejection. The peak systolic ejection pressure in the left ventricle reaches 120 mmHg and in the right ventricle, it attains only 25 mmHg. The right ventricular ejection gives rise to lesser circulation and hence low pressure is developed in it. The duration of ventricular ejection lasts for 0.25 sec. At the beginning of systole, the closure of AV valves produces I heart sound. gives rapid filling lasting up to 0.13 sec. This is followed by reduced filling (diastasis) of ventricles, as the pressure gradient is educed. The duration of reduced filling or diastasis is 0.15 sec. The end of diastole coincides with atrial systole. The atrial systole lasts for 0.1 sec. About 75% of ventricular filling occurs passively, due to fall in ventricular pressure. The atrial contraction acts as a booster pump to complete the remaining 25% of the filling. The atrial systole is not required for ventricular filling in normal heart rates. If the heart rate is higher, then the diastolic ventricular filling duration is reduced and in such cases, the atrial systolic contribution of ventricular filling becomes significant. The rapid filling phase of ventricular filling, gives the III heart sound and the atrial systole produces IV heart sound. As said earlier, the rise in heart rate reduces the duration of cardiac cycle and fall in rate, increases the duration. For example, at 60/min rate, the duration of diastole is lengthened to 0.6 sec and the systolic duration remains same. If the rate is increased to 200/min, the duration of diastole is reduced to 0.14 sec and systole is also reduced, but not to the same extent as in diastole. It is reduced to 0.16 sec, giving the total duration of cycle 0.3 – sec.